Born Cortrelle Javon Anderson on the 10th February 1991 in Vallejo, California USA, C.J. 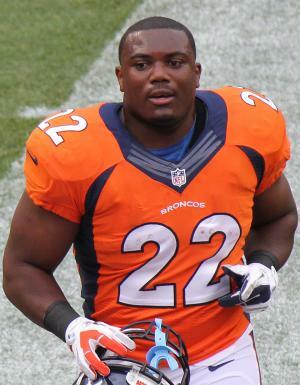 is an American Football player who currently plays for the Denver Broncos of the NFL, with which he won the Super Bowl 50 in 2016. His career started in 2013. Have you ever wondered how rich C.J. Anderson is, as of early 2017? According to authoritative sources, it has been estimated that Anderson’s net worth is as high as $1.5 million, an amount earned through his successful career as a football player. C.J. grew up in his hometown, where he went to Jesse M. Bethel High School. There, he played football firstly as a running back, and then switched to quarterback in his senior year. He posted almost 4,000 rushing yards in his high school career, leading his team to four consecutive post-season appearances, and also a shot at the state title in 2007. He received numerous recognitions, including the Vallejo Times Herald MVP award twice, and All-Solano County Athletic Conference honors in his junior and senior years, among many others. After matriculation, he enrolled at Laney College in Oakland, California where he continued to play football and was selected into the first-team All-American, All-State and All-NorCal Conference teams. However, he transferred to the University of California, Berkeley, where he continued to dominate the football field. His first season for the Golden Bears produced 345 rushing yards, with eight touchdowns and one additional receiving touchdown from 186 receiving yards. In his senior season, C.J.’s numbers were even better as he had 790 rushing yards, with four touchdowns, and 164 receiving yards and one touchdown. He was left undrafted in the 2013 NFL Draft, but then found engagement with the Denver Broncos, who signed him as an undrafted free agent. In his debut season in the NFL, C.J. played in five games, after missing the preseason due to an injury, and had only 38 rushing yards without scoring a touchdown. However, his second season was far better; he played in 15 games and in some had memorable performances, including against the Kansas City Chiefs, in which he scored a receiving touchdown and ran for 168 yards, and also scored three touchdowns against the Buffalo Bills. He finished the season with 849 rushing yards and eight touchdowns, while he also had 324 receiving yards and two receiving touchdowns. This performance earned C.J. his first and so far, only appearance in a Pro-Bowl game. He continued in the same rhythm the following season, playing in 15 games and having 720 rushing yards with five touchdowns. He was of great help in the Super Bowl 50, totaling 100 yards of offence, and scoring a two-yard touchdown three minutes from the end of the match. Prior to the 2016 season, C.J. became restricted free agent, but extended his stay at the Broncos by signing a contract worth $18 million over four years, which only increased his net worth. He received the same offer from the Miami Dolphins, but the Broncos matched the offer, and he was obliged to stay in Denver. In 2016, C.J. had to undergo knee surgery, causing him to miss the rest of the season after 24th October, so recorded seven appearances, and had 437 rushing yards with four touchdowns. Regarding his personal life, C.J. is in a romantic relationship with Raquel Torres. Other private details about C.J. remain unknown to the media.